The AFTW practice area reporting points are now available as ForeFlight and Garmin Pilot GPS overlay! We want your feedback!!! Click here to let us know if you think there is something we should add or change! 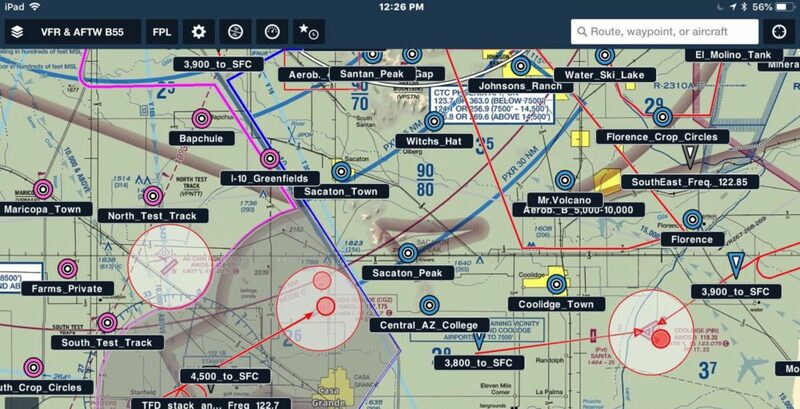 Arizona Practice Area ForeFlight/Garmin Pilot Overlay. DVT/Luke SATR LOA Sector ForeFlight/Garmin Pilot Overlay. (Updated on 11-14-2018) Explaination of DVT/Luke LOA., Official LOA. These are AFTW’s recommended Practice Area Reporting Points for the Phoenix, Southern Arizona, and Northern Arizona. Please continue to practice the FAA recommended visual scanning of your surroundings, even when communicating on the practice area frequencies. Not all aircraft know of the AFTW practice area frequencies and reporting points. Please direct any pilots who are operating in the Phoenix area to this page. The frequencies and points outlined on the Phoenix Terminal Area Chart are those that the group have generally agreed work best to improve safety in the intensive flight-training environments around the Valley. The graphical charts have been assembled by Matt Miller. Thanks Matt! The ForeFlight GPS overlays have been assembled by the AFTW Charting Team, headed by Stacy Elliott.